The postage stamp is a relatively modern invention, first proposed in 1837 when Sir Rowland Hill, an English teacher and tax reformer, published a seminal pamphlet entitled Post Office Reform: Its Importance and Practicability. Among other reforms, Hill's treatise advocated that the English cease basing postal rates on the distance a letter traveled and collecting fees upon delivery. Instead, he argued, they should assess fees based on weight and require prepayment in the form of stamps. Hill's ideas were accepted almost immediately, and the first English adhesive stamp, which featured a portrait of Queen Victoria, was printed in 1840. This stamp, called the "penny black," provided sufficient postage for letters weighing up to .5 ounce (14 grams), regardless of distance. To encourage widespread use of stamps, letters mailed without them were now charged double at the point of delivery. After Britain, Brazil became the next nation to produce postage stamps, issuing stamps made by its currency engraver in 1843. Various cantons in what later became Switzerland also produced stamps in 1843. United States postage stamps (in five and ten cent denominations) were first authorized by Congress in 1847 and came on the market on July 1 of the same year. By 1860, more than 90 countries, colonies, or districts were issuing postage stamps. Most early stamps were of a single color—the United States, for example, did not produce multicolored stamps until 1869, and they did not become common until the 1920s. The penny black and other early stamps needed to be separated with a scissors; perforated stamps did not appear until 1854 in England and 1857 in the United States. However, though larger stamps are occasionally produced, the penny black's original size, .75 by .875 inch (1.9 by 2.22 centimeters), has remained standard. Initially, stamps were manufactured by the same businesses that provided a country with currency, or by a country's mint. Yet it soon became apparent that printing stamps is unlike minting money in that the different paper types call for different printing pressures. Consequently, printing stamps became a discrete activity, though one still sometimes carried out by companies that made currency. In ensuing years, methods of producing stamps mirrored the development of modern printing processes. Today, stamp making processes utilize much of the finest printing technology available. In the United States, the decision to produce a stamp is made by a Citizens' Stamp Advisory Committee, which meets regularly in conjunction with staff from the Post Office. The committee is responsible for determining what stamps will be produced, in what denominations, and at what time. Suggestions for stamps come from throughout the country, although the committee itself might recommend a particular design. Most frequently, however, there is a large pool of recommendations with which to work. In some cases, suggestions are accompanied by drawings and pictures which might form the basis for the stamp being considered. The engraving method of intaglio printing begins with the creation of a master die on which the design of the stamp is engraved, in reverse. The design is in the lowered portion of the die—the raised portion will not be reproduced in the final product. This is an exacting hand process, in which the engraver carefully cuts a mirror image of the original drawing for the stamp. The master die impression is then copied onto a transfer roll, and in turn onto a printing plate. The impression on the plate is in the form of grooves rather than a raised image. Next, the plate is fastened into the printing press and coated with ink, and the appropriate paper is fed through the press. Printing or by outside contractors, who have been used much more extensively since the late 1980s. It's possible for a common stamp in great demand (such as an everyday first class mail stamp) to be made by the Bureau of Engraving and Printing and by several contractors. Currently, perhaps ten to fifteen American firms are capable of manufacturing stamps that meet Post Office standards. Specifications for the stamp, such as color, size, design, and even the printing process itself are then drawn up in consultation with the original artist or designer. If the stamp is to be contracted out, a "request for proposal" appears in the Commerce Business Daily, a U.S. government publication which lists contracts available to non-government firms. After the stamp is printed, samples will be sent to the International Bureau of the Universal Postal Union in Switzerland, where they are marked as samples (commonly perforated with a word such as "specimen") and then distributed to member nations to help postal workers recognize other countries' legitimate postage. In addition to requirements for the picture or design on a stamp, other requirements, all of which can be met at a printing plant, are sometimes added to a stamp's specification. The most common one is phosphor tagging, in which an invisible mark that can be read only by a special machine is placed on a stamp. The tagging facilitates the automated sorting of mail. Other requirements might be for such things as printing the stamp on chalked paper to prevent reuse of a stamp by cleaning or washing off a cancellation. When a canceled stamp printed on chalked paper is wetted, the picture will blur as the cancellation mark is wiped off, cuing postal workers to the fact that the stamp is no longer valid. Although stamps were originally printed on sheets of paper that were fed into presses individually, the paper now used comes on a roll. The two kinds of paper most commonly used to print stamps are laid and wove paper, the former with ribbed lines and the latter without. While other nations use both types, the United States presently uses only wove. Either laid or wove paper might feature watermarks, faint designs that result from differences in the pressure applied to various parts of a roll of paper during the production process. Commonly used in other counties, watermarked paper has not been utilized in the United States since 1915. At the printing plant, the process begins with the delivery of paper for stamps, with the glue already applied to the back. Two printing processes are most often used in making stamps, the intaglio process (which includes the gravure process), and the offset process. It is not unusual, however, for a particular stamp's specifications to call for the use of both methods. Intaglio, perhaps the oldest means of producing stamps, is also the most time-consuming. However, because this method creates stamps with more distinct images, the process has not been pushed aside by newer, faster, and less expensive methods. Intaglio involves engraving, scratching, or etching an image onto a printing plate, which in turn transfers that image onto paper. In one well-known intaglio process, called gravure, the image is first transferred onto the plate photographically, and then etched into the plate. This section, however, will focus on an engraving process. 1 The engraving method of intaglio begins with the creation of a "master die" in which the design of the stamp is engraved, in reverse. The design is in the lowered portion of the die—the raised portion of the die will not be reproduced in the final product. This is an exacting hand process, in which the engraver is carefully cutting a mirror image of the original drawing for the stamp. It might be several weeks before the engraver is satisfied that he or she has created the perfect duplicate. 2 After the die has been completed, it is heated to harden the engraved image. In the next step, the hardened intaglio is transferred to a transfer roll, which consists of soft steel wrapped around a rod-shaped carrier, or mandrel, and which resembles a shortened rolling pin. The transfer roll is machine-pressed against the master die, and rocked back and forth until the master die has created a relief impression on the transfer roll. At this point, the relief is a positive impression (no longer in reverse). The process is repeated until the desired number of reliefs has been created on the transfer roll. 3 Like the master die, the transfer roll is hardened by heating. It is then pressed against a printing plate, leaving another relief, again in reverse, on the printing plate. If there are several reliefs on a transfer roll, all can be passed to the printing plate. 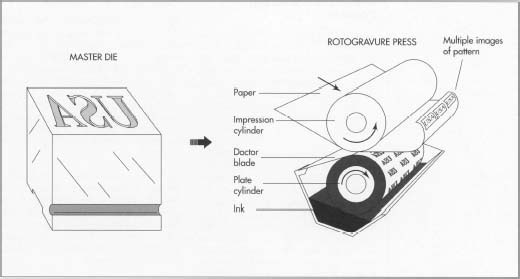 Several printing plates can be made from the same transfer roll if the decision is made to use more than one machine to produce a particular stamp. The impression on the plate is in the form of grooves rather than a raised image. 4 Once the plate is ready for use, it is fastened into the printing press and coated with ink. Inking is done automatically by several processes including spraying ink through small jets or moving an ink-covered roller across a plate. The plate is then wiped by a blade called the doctor blade, leaving ink only in the grooves. 5 The plate then presses against the paper, leaving a positive impression of the reverse image that was originally copied onto the master die. 6 If more than one color is involved, separate colors are handled by a process known as selective inking. A particular color of ink is applied by a piece of hard rubber that comes in contact with only the section of the stamp that is to receive that color. After the ink is applied in one area, another piece of rubber, with another color for another area, is used to ink another portion of the plate. 7 The offset method of printing is less expensive than intaglio and can also produce very fine results, and it is a common choice for many stamps. In this method, a picture or design is first made photochemically on an aluminum plate. Once attached to the printing press, the plate is alternately bathed in ink and water: the photochemical image gets ink, while the non-image parts are dampened with water, which acts as a repellent to the ink and ensures that only the image will be transferred to the paper. Next, the plate presses against a rubber "blanket," which carries a reverse image of the final picture. In turn, the rubber blanket contacts the paper, producing the final positive image. 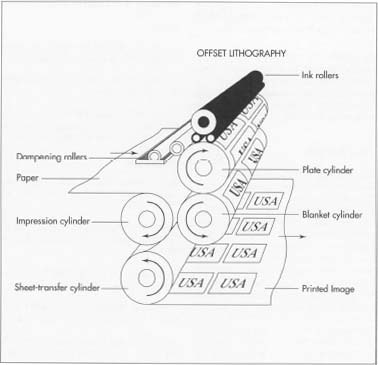 In offset lithography, a picture or design is first made photochemically on an aluminum plate. Once attached to the printing press, the plate is alternately bathed in ink and water: the photochemical image gets ink, while the non-image parts are dampened with water, which acts as a repellent to the ink and ensures that only the image will be transferred to the paper. Next, the plate presses against a rubber 'blanket,' which carries a reverse image of the final picture. In turn, the rubber blanket contacts the paper, producing the final positive image. 8 Perforations can be made either during the printing process by an adjacent machine or, less commonly, by a separate machine afterwards. In the first method, the sheet of paper is passed through a machine which uses little pins to punch the perforation holes through the paper in a horizontal and vertical grid. After pushing through the paper, the pins meet a matching metal indentation on the other side. After being perforated, the stamps move out of the press. In the other method of producing perforations, called rouletting, a wheel similar to a pizza cutter but with pins is rolled across one side of the stamped paper after it has been removed from the printing press, laying down a row of holes. Though originally a hand-operation, this method of perforation is now automated. Stamps are inspected at every stage of the printing process, by the people who are running the stamps and by inspectors whose only responsibility is to observe the process and remove errors before the stamps proceed to the next step. Printing machines are hugely complex, and errors in the printing process are a fact of life. Misfed paper, clogged inking apparatus, variations in pressure, changes in ink quality, incorrectly adjusted mechanisms, and a host of other problems can be minimized but not always eliminated. Even changes in the humidity of the pressroom can affect the press and the paper enough to produce less-than-perfect results. Several of the most spectacular errors of the past occurred because presses were manually fed; in other words, individual sheets of paper were inserted into the press by hand. If a sheet of paper required an impression from a second press (to add a second color), and the sheet was turned accidentally, the resulting stamps featured misplaced blotches of color. This type of error does not occur today because presses are roll-fed: rather than being fed into a press sheet by sheet, paper is fed in from a continuous roll. Most errors are detected, and the flawed stamps destroyed, under tight security controls in the printing plant. Enough errors slip through, however, to make the collecting of "error stamps" an interesting specialty for some stamp collectors. One twentieth-century innovation that has significantly diminished the use of stamps is the postage meter. Developed in New Zealand in 1902, meters were introduced in the United States twelve years later. In addition to their use by the federal Post Office, meters are now leased by private companies that send out large amounts of mail. These meters allow companies to post and mail letters without using stamps. Particularly popular with businesses that send out bulk mailings, meters now "stamp" over one half of the mail posted in the United States. However, individuals continue to use postage stamps, which remain not only functional but popular, as can be seen in the excitement generated by such recent stamps as those commemorating World War II, Elvis Presley, and Princess Grace of Monaco. Lewis, Brenda Ralph. Stamps! A Young Collector's Guide. Lodestar Books, 1991. Olcheski, Bill. Beginning Stamp Collecting. Henry Z.Walck, 1991. Scott 1993 Standard Postage Stamp Catalogue. Vol. 1: Basic Stamp Information, pp. 20A-26A. Scott Publishing Co., 1992. Healey, Barth. "Tactical Technology Fights Counterfeiters." New York Times. May 16, 1993, p. N22. Patota, Anne. "Coil Stamp Provides Test for Pre-Phosphored Paper." Stamps. May 16, 1987, p. 458. Schiff, Jacques C., Jr. "Much to Learn about Printing." Stamps. July 4, 1992, p. 10. "Computer Enhances National Guard Color." Stamps. November 8, 1986, p. 418. "Postage Stamp Design: Creating Art Works the Size of Your Thumb." Stamps. November 5, 1988, p. 217.